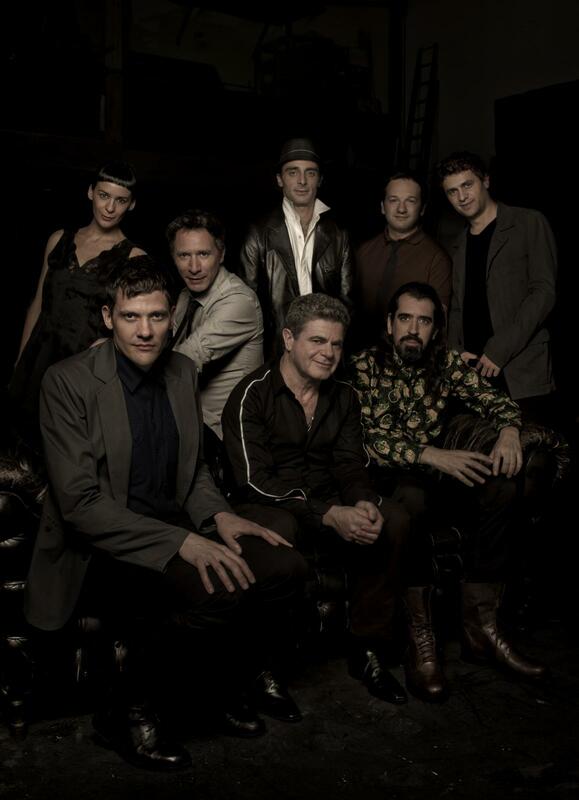 Even though Bajofondo has been a pioneer in what has been known all over the world as “electrotango,” do not mention the word in front of Gustavo Santaolalla — the group doesn’t consider it an accurate description of their music. And yet, after all this commercial and critical success, after all the accolades, Bajofondo arrived to 2012 about to get even hotter: the signing by Sony Masterworks set the stage for their most ambitious and international album to date: Presente (March 5, 2013). The album is a major turning point for Bajofondo. For the first time, Bajofondo used no vocal guests on an album, and the usual strings were magnified: again under the direction of Alejandro Terán, Presente features 11 violins, four violas, three cellos, and three stand-up basses. “This time we really worked on the orchestral parts,” said Santaolalla. “We had done something similar in Mar Dulce (2007), but Presente is a much bigger project and the album required extra time spent in that area. We’re thrilled with the results.” Several album tracks also include brass, woodwinds, harp, percussion, and even a Theremin. Even if the changes from Tango Club (2002) to Mar Dulce to Presente are evident, there’s also a Bajofondo aesthetic that remains a constant. Bajofondo’s music has no written laws; it evolves continually, but the parameters from the first album that were continued in Mar Dulce are amplified and expanded in Presente. “After playing in virtually all corners of the world, having Sony Masterworks as our new home could not be more appropriate to present the album that most closely resembles what we are as a live band,” said Santaolalla. That album is Presente, to be released 11 years since Gustavo Santaolalla and Juan Campodónico conceived the idea of bringing together a collective of Argentine and Uruguayan artists dedicated to creating “contemporary music of the Río de la Plata,” the river that separates — and unites — Argentina and Uruguay. 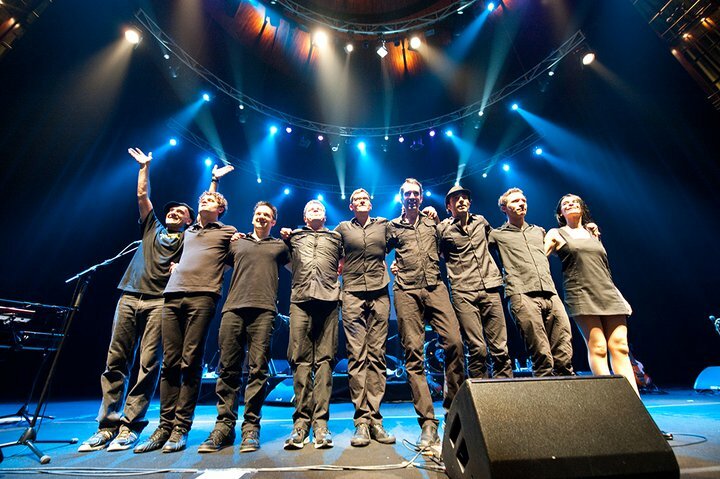 Seven albums (two as Bajofondo, a collection of remixes, and five solo releases by Bajofondo members or guests) and multiple tours later, this collective of artists with remarkable individual careers evolved to become a true band known all over the world for its stirring live performances. As Bajofondo’s music constantly grows, evolves, and expands, the denomination of “electrotango” becomes more and more inadequate. Reflecting the idea of Bajofondo as a collective under which the members also develop their own works, in 2004 Luciano Supervielle — the youngest member — released the first of two Premio Gardel-winning solo albums, both produced by Santaolalla and Juan Campodónico. As tours went by, what began as a combination of programming and samplings with acoustic and electric instruments — with emphasis on the first — has evolved into a band in which everything is practically played live, with only a minimal percentage of sequences, as shown in Mar Dulce, the first Bajofondo album using a live drummer (Adrián Sosa, now a permanent member). At the present time, Bajofondo is an eight-piece band, with seven musicians and one VJ who triggers images in real time along with the music. The success of Mar Dulce surprised no one, and the band kept touring the world in increasingly ambitious settings: in an unforgettable night of May 2010, Bajofondo performed at a sold-out Disney Concert Hall in Los Angeles with the Orchestra of the Americas conducted by Alondra de la Parra. And, as further proof of Bajofondo breaking national barriers and transcending not only the so-called “electrotango,” but music itself, the Russian gymnastics team used Mar Dulce’s "Pulmón," "Infiltrado," and "Grand Guignol" in their routine at the London 2012 Olympic Games. In the last 11 years, Bajofondo has toured all over the world non-stop, performing at the biggest and most diverse World, rock, and electronica music festivals in the world: Coachella in USA, Roskilde in Denmark, Womad in England, Cactus Festival in Belgium, Pirineos Sur Festival in Spain, Pohoda in Slovakia, World Music Festival in South Korea, as well as China, Japan, 15 countries in the European Union, including two shows at Glastonbury in 2014. The band has toured the United States twice, playing venues like UCLA’s Royce Hall in Los Angeles and Lincoln Center in NY. Through the years, Bajofondo appeared multiple times in London, including packed shows at the prestigious Barbican Center and the legendary Roundhouse. In May 2009, Bajofondo opened the Argentine Bicentennial festivities at the Obelisco in Buenos Aires in front of 200,000 people (yes, you read well: 200,000). In the same year, their hit “Pa’ bailar” was used as theme song of a top-rated Brazilian soap opera, A Favorita (TV Globo), and in January 2010 the same song became the music for the Acura TV commercial shown during Super Bowl Sunday. The new album marks a new beginning for a well-oiled machine as relevant as ever. In 2013 Presente was nominated for three Latin Grammys and won “Best Instrumental Album” and “Best Alternative Song” for “Pena En Mi Corazón”. In 2014 Presente was also nominated for three Premios Gardel, “Best Production of the Year”, “Best Video” for the song “Lluvia” and “Best Instrumental/Fusion Album”. Gustavo Santaolalla: guitar, percussion, vocals, backup vocals. Juan Campodónico: programming, beats, samples, guitar. Luciano Supervielle: piano, keyboards, scratch. Gabriel Casacuberta: upright bass, electric bass. Probably, the word that better synthesizes the multiple areas where Gustavo Santaolalla sets forth his work, is "visionary": Singer, composer, producer, guitarist, player of charango and ronroco, discoverer of talent, director of a record label and a publishing company. His vision, firmly connected with seeking an identity, covers his entire search, since his beginnings at 16 years of age with the band Arco Iris, which later on would become a pioneer in the fusion of Latin American folklore and rock. As a performer, after Arco Iris he joined Soluna, and after moving to the United States in the late 70’s, he formed the band Wet Picnic, then began a solo career that includes three albums, among them Ronroco, a record of entirely instrumental music played on charango. Starting in 2002, Santaolalla combined his talents as producer, performer and composer in the collective Bajofondo (in its beginnings Bajofondo Tango Club), with which he has completed four albums. As a producer, his career started with Leon Gieco’s first record in 1973, continued in the 80’s with iconic albums by G.I.T. and Divididos (La era de la Boludez), and at the end of that decade, with Mexican bands such as Maldita Vecindad and Café Tacuba, with these bands he set the pace for the movement known as "rock en español". In 1997, along with his partner Aníbal Kerpel, he established his own record label, SURCO, whose first release was the Mexican band Molotov, an international success selling around 2,000,000 copies. An incomplete list of his productions includes the names of Bersuit, La Vela Puerca, Julieta Venegas, Jaime Torres, De La Guarda, Arbol, El Otro Yo, Juana Molina, Orozco-Barrientos, Kronos Quartet, Antonio Carmona and Juanes. With Café de los Maestros, the double album that brings together the most significant living legends of tango, Gustavo has won two Grammy awards. The inclusion of one of the songs from Ronroco in the soundtrack of "The Insider" (Michael Mann, 1999), was the first step in his career as composer of soundtracks, working on films of some of today’s most important directors, such as Ang Lee, Alejandro González Iñárritu and Walter Salles. Santaolalla was brilliant on iconic movies such as "Amores Perros", "21 Grams", "Motorcycle Diaries", "Tierra Fría", "Brokeback Mountain" and "Babel"; with these movies he has won numerous awards, among them the BAFTA and the Golden Globe, winning two Oscars in a row from Hollywood’s Academy, for "Brokeback Mountain" and "Babel". Among the numerous awards and distinctions received by Gustavo, besides the ones listed above, we can mention the Premio Gardel, the Konex de Platino, Personalidad del Año (CAPIF), and multiple Grammy awards in various categories. Juan Campodónico has been working since the mid 90’s with one foot on global contemporary music and the other one on music from the Rio de la Plata. Campodónico was born in 1971 in Uruguay, but spent his infant years in Mexico, because his parents lived in exile after the dictatorial government took power in their country. In 1984, he went back with his family to Montevideo. Once there he was a member of various rock & pop bands, and as soon as he had access to a personal computer he dove wholeheartedly into the electronica music world. In the mid nineties, along with musicians such as Carlos Casacuberta and Fernando Santullo he created the band Peyote Asesino, the first band in Uruguay to fuse hip-hop with contemporary rock. Furthermore, Peyote’s music began to show a uniquely Uruguayan aspect in their musical proposition. The band was very well received in Uruguay, strongly influencing many groups and grabbed the attention of Gustavo Santaolalla, who produced the band’s second album in Los Angeles, Terraja, giving the band international exposure. Peyote Asesino disbanded at the exact moment they seemed to be ready to achieve massive success, but Santaolalla and Campodónico continued working together. Once Santaolalla had the concept for Bajofondo Tango Club very clear in his head, he knew Campodónico would be the perfect partner. During twelve months, the band got together in Buenos Aires, Montevideo and Los Angeles to create this new and venturesome project. In turn, Juan continued producing, working with several bands in Uruguay. In 1999, Jorge Drexler, an Uruguayan songwriter living in Spain, called Campodónico and Carlos Casacuberta (another ex-Peyote) to produce his third record for Virgin/EMI in Spain, called Frontera. The album, with its blend of electronica, folk and Rio de la Plata rhythms established a before and after in Drexler’s career; it had big commercial success in Spain, and it also generated the onset of Drexler’s massive acceptance within the Argentine market. This record was a springboard in Juan’s career as an artistic producer, which is characterized by his solid musical and technical background, but with a flexibility without preestablished formulas, that allows him to work equally with a pop group, a songwriter or doing remixes, always contributing a personal aspect without taking away from each artist’s original proposition. His next production for Jorge Drexler, Sea, received a nomination for a Latin Grammy as the Best Pop Album. The song "Mi Corazón", included in Bajofondo Tango Club, has been heard all over the world in Samsung commercials and also on a HBO series. "Montserrat" was used by Macy's. The song "Los Tangueros", of the same album, reached number 2 on the Club Play list on the Dance Chart in Billboard magazine in the United States. The most recent productions of Juan include the last two albums of Jorge Drexler, Eco and 12 Segundos de Oscuridad , and of Cuarteto de Nos, Cuarteto De Nos and Raro, the latter winner of 7 Premios Graffiti during their last edition in Uruguay, in which Campodónico received “Producer of the Year award for his works with Drexler and the Cuarteto. Juan also produced the latest album of La Vela Puerca, El Impulso. He has done remixes for Tom Jones, Badfellas, and has produced for the soundtrack of the movie Shrek II. All along Juan has been developing his profile as a DJ under the pseudonym Campo. His critically acclaimed self-titled debut was released in 2011. Luciano Supervielle was born in France, lived in Mexico and now spends time in Argentina, France and Uruguay, but he has undeniably a Rio de la Plata influence, developing a synthesis of his cultural influences of hip hop, tango, rock and Uruguayan music, with a style that blends his mastery of the keyboards and turntables, plus his arranging skills. Supervielle has produced a personal concept fusing his musical roots and translating them into a universal language, accessible, with a different reading of the tango, the milonga and the candombe, the classic sounds of the Río de la Plata. Javier Casalla has become one of the most exquisite violinists in the last decade, an inspired musician sought after by artists of many different styles for his contribution and his unequaled touch on stage and in the studio. Rock, tango, folklore, jazz or classical music, his good taste and musicality don’t know any style limitations, be it as a soloist, arranger, orchestra member or as part of a string section. Besides being the violinist in Bajofondo, Javier participates in the Cristóbal Repetto and Luciano Supervielle bands, having had a masterful participation in their albums, and in Café de los Maestros, the project that brought together the most significant living tango legends. In 2006, he released his first solo album, Javier Casalla, produced by Gustavo Santaolalla, in which he pays tribute to the role violin plays in tango, overdubbing his instrument until achieving the sound of a sextet. Javier Casalla comes from an essentially musical family; his father, Eduardo, is one of the most recognized drummers in Argentina. In 1983 he began studying the violin with Boris Chumachenco and Ljerko Spiller as his main teachers. He was hired for the first violin section of the Orquesta Filarmónica de Buenos Aires. In 1992 he won the audition for the sixth chair first violin in the Orquesta Sinfónica Nacional, a position he maintained until 1998. At the same time, he developed a very busy schedule in the popular music world, playing live and recording with a great number of tango, rock and folklore artists. He also participated in the soundtracks of numerous movies, such as "Amores Perros", "21 Grams", "Tango", "Sol De Otoño", "Cohen vs. Rossi", "Herencia" and "Motorcycle Diaries". Among the many artists he has collaborated with we can mention, in rock, Gustavo Santaolalla, Bersuit, Divididos, Charly García, La Renga, Los Piojos, Los Pericos, Gustavo Cerati, David Lebón, Babasónicos, Demonios de Tasmania, Deep Purple, Julieta Venegas, Celeste Carballo and Juana Molina; in folklore Jaime Torres; in jazz Lalo Schiffrin; in ballet music Julio Bocca; in tango Daniel Melingo, Sexteto Baffa-De Lío, Quinteto José Colangelo and the orchestras of Francisco Canaro and Juan D’Arienzo; he also toured Japan with these two orchestras. He is one of the few bandoneon players who finds himself at the crossroads of the traditional and the experimental vanguard music. He is influenced by minimalism and the new directions in music as well as tango classics (in particular Astor Piazzolla). Martín distinguishes himself for his unique style on the bandoneon and for having always been connected to hypnotic and dance music. He composes music for Theatre and Dance. His compositions have been performed on the main stages in Argentina, including the Teatro Colón in Buenos Aires. He has accompanied many well-known tango and experimental music artists. He has a scholarship from the Fondo Nacional de las Artes. He began in Mexico in 1982 as a session musician, working live and in the studio with many famous Uruguayan artists. Back in Uruguay, he played in several local rock, jazz and hip hop bands, among them Plátano Macho, along with Luciano Supervielle. Since then he has been producing songs and remixes for Uruguayan bands, as well as working on his own electronica music projects. Gabriel participated in the last two albums of songwriter Jorge Drexler, Eco and 12 Segundos de Oscuridad. He has also produced music for movies and television. As the drummer of the world’s ultimate tango/electronica collective, Adrián Sosa is the beat of Bajofondo. And it all happened in the most natural of ways. 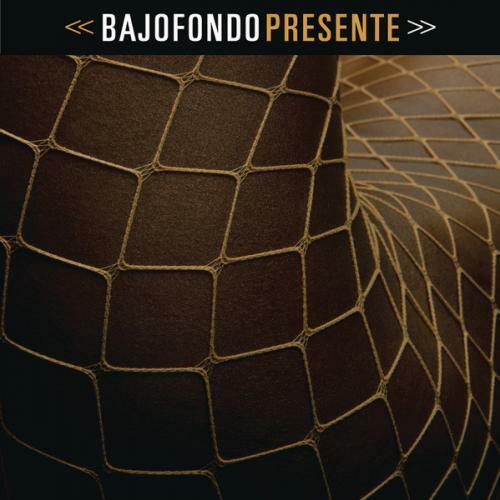 After the award-winning, critically acclaimed Bajofondo Tango Club (2002) and its follow up, Bajofondo presents... Supervielle (2005), both of which used digital drums, during the recording sessions for Mar Dulce (2007) two-time Academy Award-winning producer and composer Gustavo Santaolalla decided to try a couple of live drum songs, and asked Adrián, his right-hand man and creative partner at the Surco label, to sit in. Sparks flew and, instead of two, 16 tracks were recorded in two days and the rest is history: Bajofondo became a full-fledged band, and Sosa became the full-time drummer, both live and in the studio. Verónica Loza is an artist who works at connecting staging with music. The digital image played in real time is one of the tools to connect these elements through the process of computer images. During Bajofondo’s shows we can see Verónica playing her keyboard and controller as one more musician. When playing visual fragments and mixing them live she translates the work the band has done redefining the context of tango into the visual realm. Plus, in the new album, Mar Dulce, Verónica writes and sings one of the songs, "Tuve Sol". Verónica was born in 1973 in Montevideo. She has been a lighting, staging and costume designer since 1996. Some of her many lighting designer projects include "La fuerza de la costumbre" (2003), "Cenizas"(2003), "Nous, les Héros" (2002), "El sueño y la vigilia" (2001), "Banderas en tu corazón" (2001), "Ayax" (2000), "Masculino Femenino" (local and international presentations 1997-1999). She was commissioned by Didos S.A. to be in charge of the general design for a lighting exhibit of the latest generation of intelligent equipment for television, theatre, shows and building façades (1999 Oceania Hotel). Music: Bajofondo Tango Club (shows and international tours 2003 until today); Jorge Drexler (CD Sea, shows and international tours 2001-2003); Peyote Asesino (shows and international tours 1996-1999), among others.